Deliberately hiding this“disaster”, as it was characterized, behind hype and politics is unpardonable. Deliberadamente ocultar este “desastre”, como se caracterizó al proyecto, detrás de propaganda y política es imperdonable. 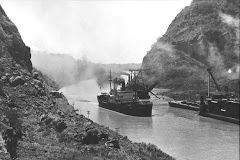 Without a doubt the feat of completing the Panama Canal nearly a century ago created the eight wonder of the world. The service the canal offers world markets has grown to such an extent that – despite tolls having been raised more than 1000% in just over ten years – more cargo transits it today than ever before. Clearly, it's worth expanding. Precisely because its service is in such high demand, it is paramount to ensure that it is expanded as effectively as possible, taking into account all costs, which should fully include impacts to third parties and to the environment. A mediocre expansion, or worse yet what is being built today, is not acceptable. The plan today is to build a set of locks with three steps at each end of the canal – a single-lane with a total of 6 chambers and 18 “recycling” tanks – that will be too expensive and complicated for the service it will provide. There are far more effective designs – that incorporate similar parts and equipment, but which are more modern by one or two generations – that can markedly increase service while using less water. Moreover, with their more effectively meshed parts and operations, the more modern locks require fewer mechanical operations and less water transfers to accomplish their function than the one planned.What is being constructed has additional drawbacks. With more manipulations to perform, the locks now planned will require more maintenance than more modern locks. Furthermore, the dam over active faults required in conjunction with these locks will put the entire canal at risk, which is totally avoidable with the more efficient and more profitable newer locks. If those facts were not cause enough to opt for better locks, what is being planned today – should it be built and begin to operate – will quickly turn Gatun Lake salty and create an avoidable saltwater migratory pathway across the Isthmus of Panama putting many marine species along both sea coasts at risk of extinction. That could irreversibly reduce the variety of Caribbean Sea and Pacific Ocean catches. Additionally, Gatun Lake's invaluable fresh water will be contaminated for no reason, other than to transfer the business of supplying Panama's public drinking water into the hands of those who recently acquired water rights to the rest of the country's rivers. Finally, once this expansion farce is completed and the new system is operational, it won't be possible to convert it into one less harmful nor to undo damages it inflicts upon the oceans – we don't have that magic. Knowing all this, one must ask how this expansion ended up with this plan, and why it continues on this course? Personal experiences recounted below should shed some light. Decisions on what would be built had apparently been taken two years prior to Panama announcing its intention to expand the canal. I conclude this from what I experienced.Two years after the plan to expand the canal had been announced – which occurred in late 2002 and was followed in early 2003 by the Discovery Channel program on the subject – I presented to the engineers of the Panama Canal Authority (known as the ACP) a mechanical device for lifting ships. When I concluded my presentation, I was informed that I had arrived four (4) years “too late.” That is to say, the decision on how the canal would be expanded was taken shortly after the U.S. fully relinquished control of the canal to the people of Panama. One has to wonder during what space of time the process of identifying, configuring, assessing and comparing possible lock options was undertaken that led to choosing those with side-tanks? During the years that Panama shared canal management with the United States no such studies were performed. If some cases were actually evaluated but not publicized, when was that and where are the details of those assessments? Those presented in the project's Master Plan as the “alternatives” evaluated are absurd. Astoundingly, the Master Plan doesn't even list the challenges and requirements on which to base the design of the chosen locks, or of any other options. Without that data, “designing” anything isn't possible; much less preparing comparative studies. There is no evidence of any definitive studies actually having been made. Those attending public forums held before the referendum were repeatedly reassured that – once the expansion was approved and funding became available – project details would be more fully evaluated and that their concerns would be satisfactorily resolved before proceeding. But, those assurances vanished into oblivion once the go-ahead vote was obtained. These facts are not in keeping with the project's claimed high levels of “transparency”. From the technical point of view it was very difficult to grasp why things were following such a seemingly illogical path. However, the reason became quite clear when considering that financial manipulations were likely afoot to get development bank loans as soon as possible. Based on the observable, it appears that just one option – one that banks would accept as valid – was “prepared”. It seems what only mattered was to meet initial loan application requirements and to submit those without delay. That goal was achieved using the side-tank locks. From that point forward all has seemingly been a “media show”, staged to direct attention away from project details containing discrepancies that contradicted statements made to the banks, thereby avoiding discoveries that would jeopardize receiving the desired funds promptly. Concluded from that is that this is why discussions of critical technical points were evaded during the public forums. Out of the propaganda fog, the plan that has emerged appears to be based on falsehoods. In order to distribute contracts as soon as possible it was most important that nothing delay the receipt of the loans from the development banks. The disclosure of any issues at odds with “use” requirements tied to such development loans would have called for actual assessments to be performed, which would have caused the loans to be delayed or even canceled. What is disturbing is that – while the moderators of forums held across Panama freely dodged discussing key technical issues, going so far as to ridicule people that asked serious and pointed questions – other entities, such as international banks, apparently accepted all assurances of clear sailing with little or no questioning. The way it looks, to expose what is convenient – and not what is not – is how transparency is being applied. That this attitude is not confined to only Panama, the “WikiLeaks” made quite clear. From the announcement of this project to this day – and true in Panama, as well as in most of the “developed” world where there are projects underway that depend on this one being “successful” – there has been no coverage in major national or local news media critical of the present canal expansion project or presenting other views or considerations. Even recent failures around Panama of infrastructure – built by companies tasked with important aspects of the expansion – have failed to elicit even mild reactions. That all suggests that major interests are at stake everywhere. That a public works project – and in particular one as large as the Panama Canal, and of such importance to the world – should proceed to construction without having ever held any truly open and frank discussions or debates, at least with respect to its most critical element, is thoroughly unacceptable. Never before on this planet has a project of this magnitude come into being with the “perfect” solution already identified, nor is this the first to do it despite what its promoters wish to claim. Locks with side-tanks as applied in this project are highly inefficient and very harmful. Nonetheless, the project is proceeding as is and without hindrance – in full denial that much more appropriate lock arrangements do exist – presumably due to a plethora of third-party interests. Present-day discussions regarding this expansion continue to principally focus on financing and profitability, as they've done since 'Day One', but never has it been brought to light that – for an equivalent investment – expected revenues could be substantially greater with other locks. Beyond repeatedly declaring that the chosen locks were the only possible and most appropriate for the project, in what can only be characterized as pure propaganda, technical arguments to validate that assertion were never presented nor discussed, nor were the superior economic benefits attributed to them ever substantiated. Developing locks that reduce water-use most effectively has – for decades – been considered the key to a successful expansion of the Panama Canal. Yet, this expansion's promoters have offered no proof of ever having truly performed the assessment studies necessary to identify the most effective locks. There are four techniques that have been around since before the previous century for reducing the volume of water locks expend to raise and lower ships. But, personal experiences with the project have led me to conclude, that those putting the project together either did not know of all of these techniques or, for some irrational or obscure reason, chose to ignore them. The locks selected for this Panama Canal expansion contain only two of the four water-saving techniques. The canal's original locks contain three. Independent studies have identified alternative lock arrangements of comparable cost that use other combinations of those techniques more effectively. With the most effective combination, the number of daily transits could be increased by at least two-thirds, with each transit using less than two-thirds of the water the planned locks will use. Promoters claim that the planned locks will use 40% of the water a “normal” lock would expend when operated like those of today's canal. But, in reality – given that they have only one lane – they will use closer to 45%, because the claimed 40% does not include the water expended to periodically reverse traffic. In contrast, the simplest of the better alternatives would reduce water use to 37% of “normal”. 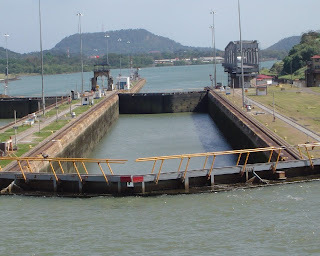 This simplest lock alternative would consist of four enlarged copies of the canal's present-day Pedro Miguel Locks (a one-step, two-lane lock unit), but with each copy including an uncomplicated culvert layout change. Designers had originally considered using that layout over a century ago, but with saving water not an issue in their day, and since using it would have cost more, it wasn't. Now, it would be worth it. Two of those enlarged and modified units, with a short channel segment – comparable to today's Miraflores Lake – between them, would be used at each end of the canal in this simplest two-step alternative. About the same volume of concrete, needed to build the single-lane locks with recycling tanks now planned, would be needed to build this simpler two-lane alternative that has no recycling tanks. Additionally, this option would require less maintenance by virtue of having fewer parts. Plus, it would avoid the planned one-lane system's potential for a complete interruption of service. An even more efficient option would be one similar to the Pedro-Miguel type just described, but this version would have two recycling tanks added between each of its unit's chambers. About 20% more concrete would be required to build this layout, but it would use only 25% of the water that “normally” operated locks would use as compared to the 40+% that the current selection will use. This layout uses tanks much more effectively than the planned design. Due to the sharp reduction in water expended per transit by this most efficient lock option, which is less than two-thirds of what the planned locks will expend, 20 ships a day could be transited with the same water that will be used to transit 12. Plus, up to 22 ships could be transited whenever extra water happened to be available. In short, with little additional investment at least 160% of the revenue now expected could be realized. Considering all the lock capabilities that exist, there's no doubt that the current expansion's return-on-investment can be improved while reducing its complexity. Known risks and unacceptable damages can be avoided by applying proven technology much more effectively. Without adding much to the cost now, better performance can be achieved and maintenance needs reduced. However, if not addressed now, making changes afterward to attain equivalent capabilities will be impossible or prohibitively expensive. The current plan makes no sense from the perspective of rational long-term goals, which are what the project should be targeting. What is the benefit of, or who is benefited by, adding a catastrophic risk to the Panama Canal and irreparably damaging the environment? More modern lock arrangements would offer yet more advantages. Occupying less space, coupled with greater efficiency, they make future expansions more feasible. A risky dam over active fault lines – that could cause the loss of Gatun Lake – would be unnecessary. Using better arrangements would also result in markedly less saltwater intruding into the lake. As a bonus, they include an effective method to mitigate salt intrusions over the long haul, made possible by the system's better integration of parts and operations. The alternatives presented above would be compatible with loan requirements, with no need to contemplate deception. They would also improve possibilities for future growth. With so many advantages within reach one must question the benefit to the canal and to shipping to spend so much money – resulting in higher toll charges – to add one lane of locks that will yield only two-thirds of the transit service that would be offered by an expansion that uses the best locks available. Throw in the avoidable negative impacts that the current plan will inflict on Panama's population, which will further add to the project's true cost, and one must ask how is Panama benefiting from all this? Again, what is the logic of this project on its present course? It is now being heard that in the areas west of the canal's Trinidad River Basin – waters of which have always been considered the canal's reserve for when “all else fails” – residents are being told to begin preparing to abandon their homesteads to make way for the area's incorporation into the canal's watershed. Prior to the referendum it was declared that the canal's watershed would not have to be expanded for this project. As the present-day canal basin receives more than enough rainfall to supply this expansion, the planned locks were modified – by adding the third side-tank to each chamber, which reduced their water-use to the “40%” noted earlier – and the range over which Gatun Lake's level fluctuates was increased so as to augment the volume of water that is “usable” in lock operations. But, the validity of this rather complex plan was never substantiated, nor was its cost ever estimated. Nonetheless, on the basis of this “revised” plan – and with the approval of a law “against new reservoirs” – it was nationally declared that the concerns of those residing in the area in question had been addressed, and the process moved on to the casting of the votes that “approved” the project. Now, with vote in pocket, it would seem that the project intends to proceed with expanding the canal's watershed, thus sealing the deception. These developments suggest that there was never any intention of making adjustments within the boundaries of the present-day canal watershed to make up for the projected operating water shortfall. In the same way that a proper lock selection study was seemingly by-passed, reviewing and evaluating ways to augment current watershed usable water volumes also appear to have been skipped. Both efforts must be done before any responsible decision on enhancing the watershed can be taken. What Panama's people were asked to decide was whether or not they wanted the canal expanded. They weren't asked anything else. However, it appears that – in a referendum where very few citizens showed up to decide the fate of their most important asset – the “yes” they gave to kick off the project has seemingly been construed as a signing-over of that asset to the project's promoters. The people have, in essence, lost all rights to intercede in affairs of the project, regardless of how it impacts them and how much they object. As they say in Panama, “va como va porque va”, meaning “it's going as is, because it's decided”. Effectively, there are no independent review mechanisms in place to protect the best interests of the asset's supposed owners. The foxes are in charge of the hen house. The plebiscite I denounced as undemocratic, because in a true democracy the government cannot officially promote one side of an issue that requires a popular decision as was done in Panama. Political parties can take sides, but the government must remain neutral. I also denounced the public forums that preceded the plebiscite for having been partial, alleging they were manipulated so as to evade disclosing issues that could have turned the vote. Moreover, prior to the referendum all information relevant to the important decision soon to be made was not freely accessible. One had to file a request for additional information and explain why it was required. This not only discouraged research of the project's details by third parties, it reduced the likelihood that those who pressed on would discover all the details. As the process was structured, critical details could be left out of the response to a researcher's request. As a researcher had no way of knowing in advance precisely what to specify in a request to ensure receipt of potentially contentious details, it was virtually impossible to receive those details. The process leading to the referendum was not transparent, and nothing has changed since then. Based on the foregoing, I reject outright the notion that it's “too late” to roll back the locks that were chosen for this expansion of the Panama Canal. Most disgusting is the manipulative attempt afoot to make the project's on-time completion a matter of national pride in order to gain the public's backing of a second rate, ineffective and harmful plan. Irresponsibility is never acceptable and should not be rewarded. To say it is no longer feasible to make changes because that time “has passed” is nonsense. Considering the time value of money, if the value of the time it would take to reconsider the present plan were measured against not only the value of the increase in transport services that could be attained with another plan, but also against the reduction of other work along the way, there is no doubt that better locks would make this expansion much more profitable. Be it known that there is a second expansion already planned – which is something that was not disclosed to the Panamanian people, but is not a secret overseas. Being a clone of the first, that second expansion will be equally ineffective and damaging. The same cost-reducing and service-increasing improvements that would benefit the current expansion would also benefit any future expansion. What is more, by changing the chosen locks now to ones that perform better, the projected subsequent expansion could be postponed indefinitely. However, if the project proceeds as planned, the canal’s future growth will be cut short severely, and that will be irreversible. Quite frankly, it would be preferable to pay the contractors to build nothing than to bring to fruition what is presently planned. Only the project's choice of locks is being argued in this document. The casting of the concrete that will form them has not begun. None of the digging of new navigation channels would be lost, nor would the work already done to enlarge existing ones go to waste, by changing the choice of locks. In addition to the presented arguments against the chosen locks, I denounced the planned incorporation of territories to the west of the canal's Atlantic entrance because the need for more water is integrally linked to the choice of locks and because a proper assessment of the many enhancements that could be made to the existing watershed to increase its yield has not been done. These shortcomings must be attended before launching any watershed expansion. It would seem that the current Panama Canal expansion plan has everything to do with maximizing construction efforts, be that by way of excavating channels and casting locks, or by way of enlarging the watershed. Getting after all of it as quickly as possible is clearly of paramount importance to someone. Maximizing the potential of the canal appears irrelevant to the plan. Likewise, damages to third-parties and the environment are not relevant. That work advances, and that money flows without delays, seems to be all that matters. The rush to distribute lucrative contracts, along with the rush to take advantage of all of the country's other resources at one go – something that would never be done by truly first-world countries with responsible leaders – creates the strong impression that what motivates those who are actually running Panama is to become multimillionaires at the public's expense. We must put a stop to all these scams. If this course is maintained, there will be little left of the jewel that was Panama in the last century. All the flora and fauna that Panama is famous for is about to be wiped out, along with most of its rural and indigenous cultures, just to feed the greed of a few powerful men. Expanding the Panama Canal is worth doing. We have the knowledge and the technology to do it right. There is no argument with which to justify advancing an inefficient expansion of the Panama Canal that will forever expose it to the danger of being flushed to sea – along with everything on its banks – because of a dam being irresponsibly built atop active faults. Furthermore, to permanently put this canal's maximum potential permanently out-of-reach, and to risk eradicating marine species due to unjustifiably pushing ahead a bad choice of locks that will salt-up Gatun Lake, would be to disregard – with total contempt – more than a century of responsible studies and evaluations. Ahora está en construcción un sistema de esclusas con tinas de reciclaje que es demasiado costoso y complicado para lo que proporcionará. Hay otros sistemas confeccionados de los mismos componentes, y más modernos por una o dos generaciones, que rinden significativamente más servicio usando notablemente menos agua. Es más, por como se han engranado más efectivamente los componentes y sus operaciones, sistemas más modernos logran reducir el número de manejos mecánicos y de traslados de agua. En base a lo observado, pareciera que sólo una opción – una que los bancos aceptarían como válida – fue creada. Por lo visto, lo único de importancia era poder cumplir con los requisitos iniciales para completar y presentar las solicitudes de préstamos con prontitud. Esa meta se alcanzó usando las esclusas con tinas. Lo curioso es que – mientras que en Panamá se permitía que los moderadores de los foros esquivaran discusiones claves llegando hasta burlarse de personas que hacían preguntas serias y puntuales – otras instituciones, los bancos intenacionales en particular, daban la impresión de aceptar todas las garantías del proyecto sin, o con un mínimo de cuestionamiento. Desde que se anunció el proyecto de ampliación y hasta la fecha – ni en Panamá, ni en paises “más desarrollados” en donde han lanzado proyectos propios que dependen de que se realice este a tiempo – no se ha publicado en medios de alta circulación, ningún artículo que lo critique o que presente otros puntos de vista. Sugiere que todos tienen intereses de por medio. "Que una obra pública – y en particular una tan grande como es la del Canal de Panamá, y de tanta importancia para el mundo – avance a su construcción sin discusiones ni debates abiertos e interactivos, por lo menos con respecto a su elemento más crítico, es inaceptable." Discusiones acerca de esta ampliación siguen, como desde el inicio, centrados principalmente en su financiamiento y en su rentabilidad, pero jamás se ha divulgado que — por la misma inversión – los ingresos previstos pudieran ser muchísimos más. Más allá de haber sido repetidamente declaradas las esclusas más apropiadas para esta ampliación, en lo que se puede caracterizar como propaganda, los argumentos técnicos para sustentar esa calificación jamás fueron presentados ni debatidos, ni tampoco sustentaron los supuestos beneficios económicos superiores que aportarían. Otra opción, similar a la descrita de tipo Pedro Miguel tendría dos tinas entre sus dos carriles, y requeriría cerca de 20% más concreto para construirla. Sin embargo usaría sólo el 25% del agua que usarían esclusas “normales” operadas como las actuales, comparada a la selección actual que usará 40% más. Debido a la marcada reducción de agua consumida por cada buque transitando a esta opción más eficiente, se podrían transitar hasta 20 barcos al día con la misma agua que transitará los 12 previstos para la ampliación actual, y hasta 22 cuando haya más agua. .
Considerando lo antedicho, hay varias formas para incrementar el rendimiento de la inversión que se está haciendo en esta ampliación. Sus riesgos y daños se pueden evitar con un mejor uso de la tecnología disponible en la actualidad y un mayor rendimiento se puede obtener sin costo adicional de importancia. La selección actual no tiene sentido así que ¿cuál es el beneficio de introducirle un riesgo catastrófico al sistema canalero y de dañar al medio ambiente irremediablemente? Mejores arreglos de esclusas añadirían otros beneficios. Ocuparían menos espacio, permitirían eliminar el dique peligroso sobre fallas activas – que podrá ocasionar la pérdida del Lago Gatún – y reducirían marcadamente la entrada de agua salada al sistema. Además, incluirían un método efectivo para mitigar la intrusión salina al lago Gatún, a largo plazo. Con tantas ventajas al alcance hay que preguntar ¿cuál es el beneficio para los negocios del transporte marítimo y del canal de gastar tanto dinero en esclusas que, con peajes más altos, rendirán sólo dos-tercios del servicio de tránsitos que rendiría una ampliación que utiliza el mejor de los sistemas de esclusas hoy disponibles? Y, aún falta considerar los impactos negativos evitables a la población causadas por la ampliación en su forma actual. Sin embargo, con ese plan – y con la aprobación de una ley “en contra de embalses” – se declaró que las preocupaciones de los moradores de la zona oriental habían sido “atendidas”, y de allí se procedió al voto que aprobó al proyecto..
Esos sucesos sugieren que nunca hubo intención de hacerle ajustes a la cuenca actual para obtener el agua requerida para un Canal ampliado. No han sido investigadas a fondo las formas de mejorar el manejo de la cuenca. Eso habría que hacerse antes de decidir ampliarla e impactar áreas nuevas. Lo que al pueblo se le preguntó era si querían o no que se ampliara el canal. No se les preguntó más nada. Sin embargo, pareciera que el “sí” que el pueblo dio se ha convertido en una entrega total de éste bien a los promotores de la obra. En efecto, el pueblo panameño ha perdido todo derecho de involucrarse en asuntos de la ampliación; no importa cómo impacte al público, ni que el pueblo se oponga, “va como va” porque va.
Al igual denuncio los foros previos al plebiscito por no haber sido imparciales. Alego que fueron manipulados para evadir discusiones serias que pudiesen haber cambiado el resultado del voto. Es más, previo al plebiscito toda la información relevante para la importante decisión a mano no era de libre acceso. Había que presentar una solicitud para obtener información adicional y explicar porqué se necesitaba. Eso no sólo desalentaba el proceso de investigación por terceros, pero también impedía que uno revisara todos los aspectos libremente para descubrir todo el detalle. Como fue manejado, detalles críticos podían quedar fuera de la respuesta a la solicitud, ya que el trámite aseguraba que el investigador no encontrara los contenciosos. Él no sabría por antemano cómo preparar su solicitud con la exactitud necesaria para asegurarse de recibir esos detalles. En base a lo antedicho, rechazo rotundamente la excusa de que ya es “muy tarde” para echar atrás la selección de esclusas para esta ampliación del Canal de Panamá. El convertir la tarea de completar la obra en un asunto de orgullo nacional – para ganar el respaldo del pueblo para un plan inefectivo, dañino, y de segunda – es repugnante. Junto con mis argumentos en contra de las esclusas elegidas, denuncio el plan de ampliar la cuenca hidrográfica del canal hacia el noroeste porque la necesidad de ampliarla está íntegramente ligada a las esclusas que cuestiono y porque falta hacerse un asesoramiento veraz de las diversas mejoras que podrían introducirse en la cuenca existente. Hay que subsanar estas faltas antes de proceder con la ampliación de la cuenca. Pareciera que el plan actual de ampliación del Canal de Panamá tiene todo que ver con maximizar la construcción en materia de excavaciones y estructuras, más asegurar la incorporación de las reservas de agua lo antes posible debido al trabajo que eso agrega. Maximizar el potencial del mismo canal no parece formar parte del plan, pero sí las ganancias de los involucrados en la obra. Daños a terceros y al medioambiente ni figuran. "El apuro de repartir contratos lucrativos, junto con el apuro en sacarle provecho a todos los recursos del país de un tiro – algo que nunca se haría en verdaderos países de primer mundo con dirigentes responsables – crea la fuerte impresión que lo que motiva a los que están a cargo es hacerse multi-millonarios a costillas del pueblo." No hay justificación alguna para una ampliación mediocre que expone a este canal al peligro permanente de su pérdida total a causa de un dique construido irresponsablemente encima de fallas activas. Poner fuera del alcance al potencial máximo del Canal de Panamá y arriesgar a especies marinas a causa de unas esclusas mal escogidas de ineficiencia perpetua que salinizarán al Lago Gatún, sería descartar – con desprecio total – a más de un siglo de estudios y evaluaciones responsables.